Received 12 March 2011; revised 4 April 2011; accepted 19 April 2011.
related to surface wind and radiation forcing. 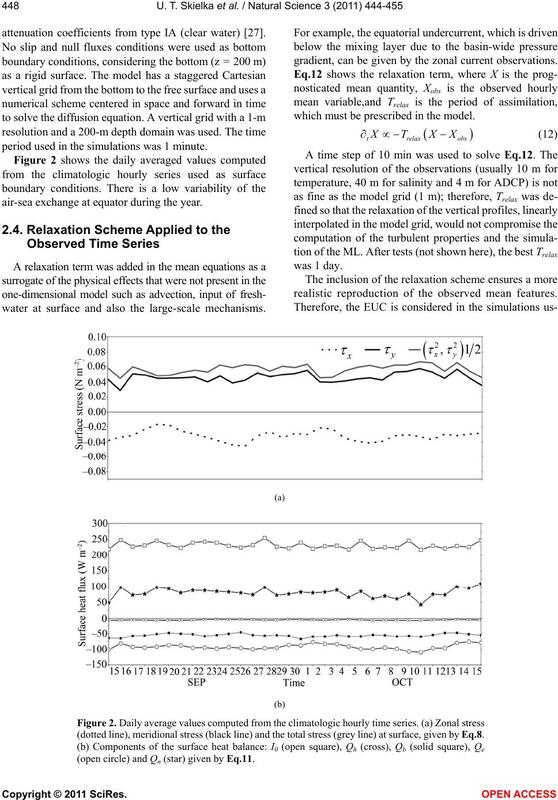 tenance of the westward equatorial undercurrent (EUC). which there is a region of intense shear. high-resolution observational data is not available. 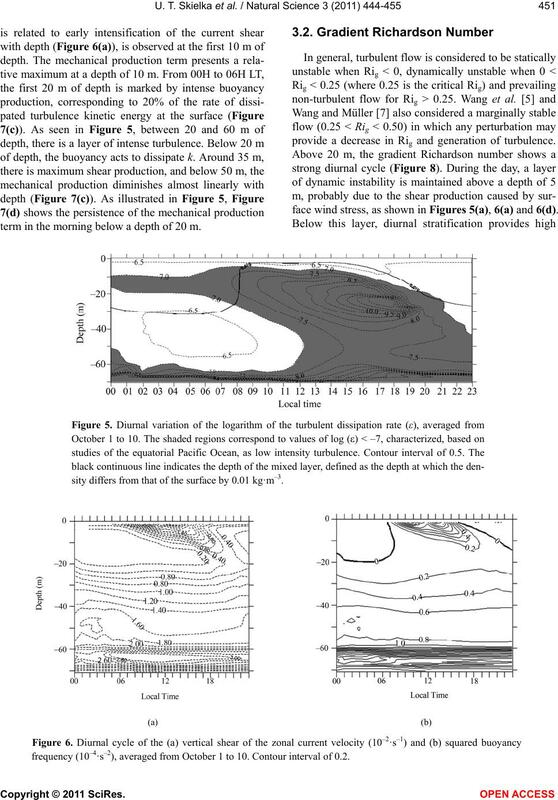 turbulent processes in the Pacific Ocean [4-7]. turbulent upper layer in the equatorial Pacific Ocean. *This research was supported by CNPq, Fapesp and IRD. tween below the ML base and the EUC [2,8,9]. ing in a decrease in the gradient Richardson number (Rig). contributor to deep turbulence production. to studies of the equatorial Pacific Ocean. was run using the PIRATA dataset. , and ρ0 (1027 kg·m–3) is the reference density. tails can be found in . vertical profiles (0 - 500 m) of temperature and salinity. rizes the data set used in this work. variable used in the simulations. humidity (q0, grey line); and (d) accumulated precipitation. rithms can be found in [24,26]. attenuation coefficients from type IA (clear water) . period used in the simulations was 1 minute. air-sea exchange at equator during the year. water at surface and also the large-scale mechanisms. gradient, can be given by the zonal current observations. which must be prescribed in the model. realistic reproduction of the observed mean features. 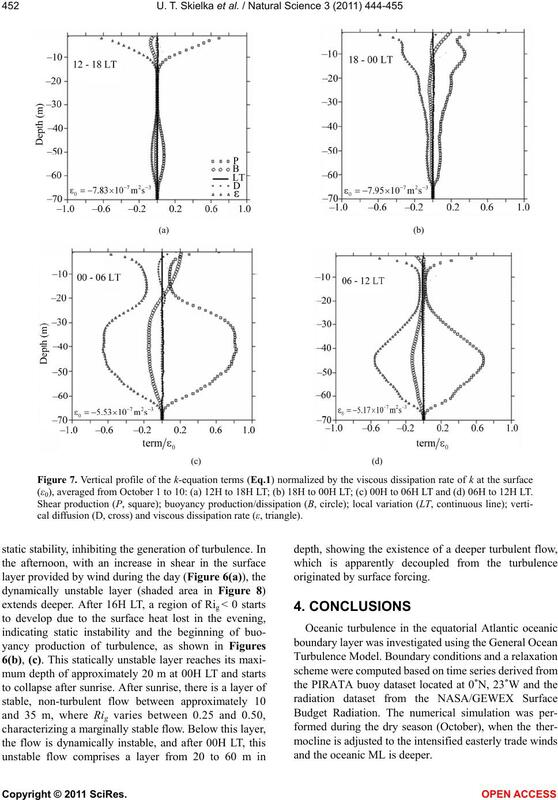 (dotted line), meridional stress (black line) and the total stress (grey line) at surface, given by Eq.8. (open circle) and Qn (star) given by Eq.11. variation of the zonal current. layer depth reaches approximately 60 m.
urnal variation similar to that observed in Figure 4(a). ing its maximum diurnal depth at sunrise. 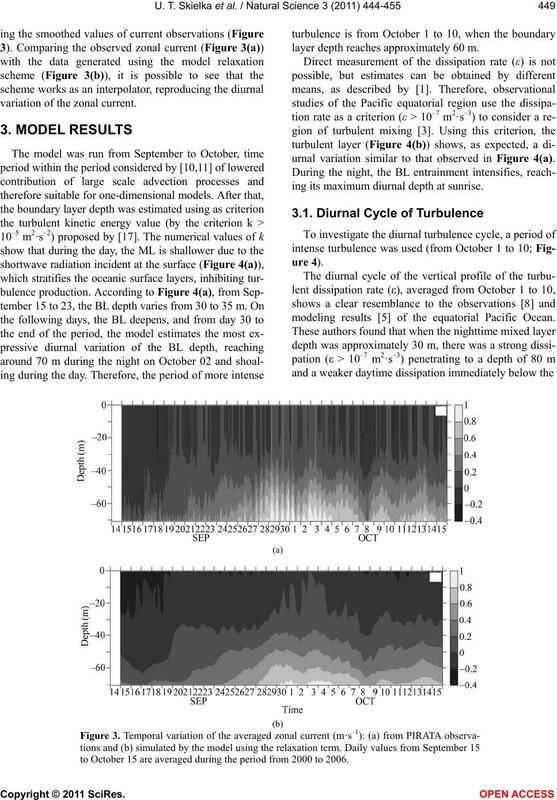 modeling results  of the equatorial Pacific Ocean. 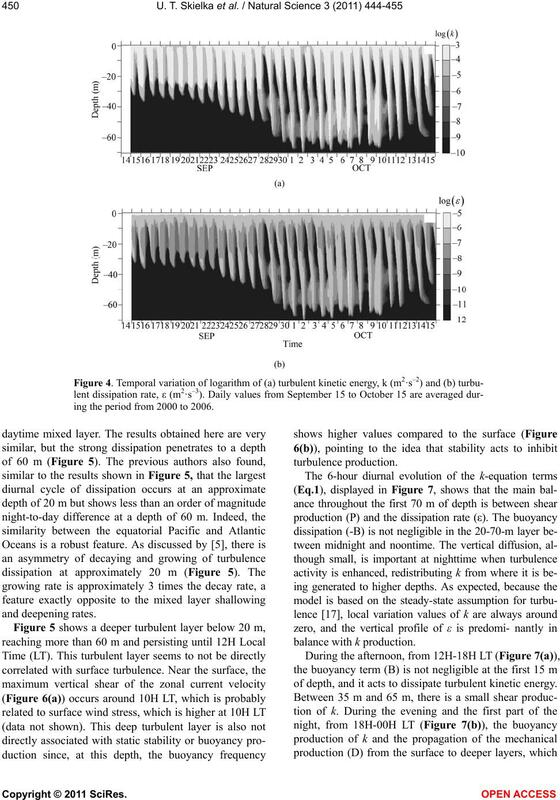 to October 15 are averaged during the period from 2000 to 2006.
ing the period from 2000 to 2006.
of depth, and it acts to dissipate turbulent kinetic energy. term in the morning below a depth of 20 m.
provide a decrease in Rig and generation of turbulence. 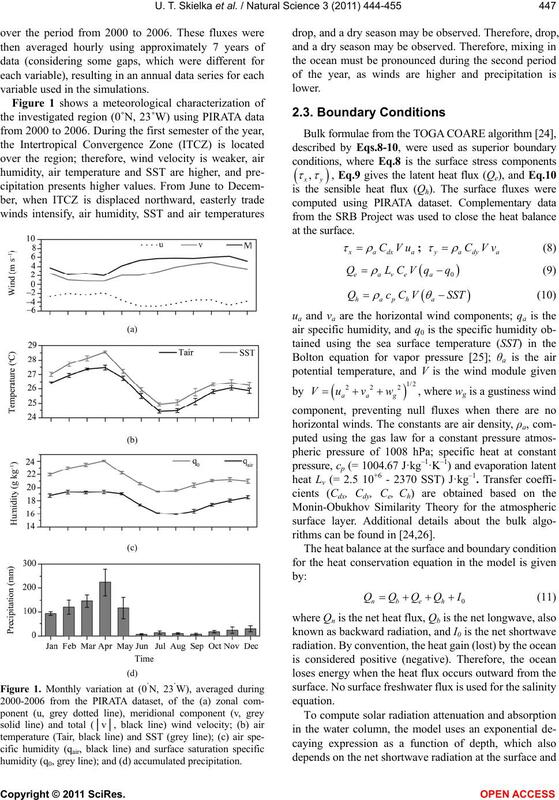 face wind stress, as shown in Figures 5(a), 6(a) and 6(d). sity differs from that of the surface by 0.01 kg·m–3. frequency (10–4·s–2), averaged from October 1 to 10. Contour interval of 0.2. (ε0), averaged from October 1 to 10: (a) 12H to 18H LT; (b) 18H to 00H LT; (c) 00H to 06H LT and (d) 06H to 12H LT.
cal diffusion (D, cross) and viscous dissipation rate (ε, triangle). and the oceanic ML is deeper. and continuous lines indicate, negative and positive values of Rig, respectively. lence originated by surface forcing. with studies performed in the equatorial Pacific Ocean. ing the night in the simulations (Figures 5 and 6). 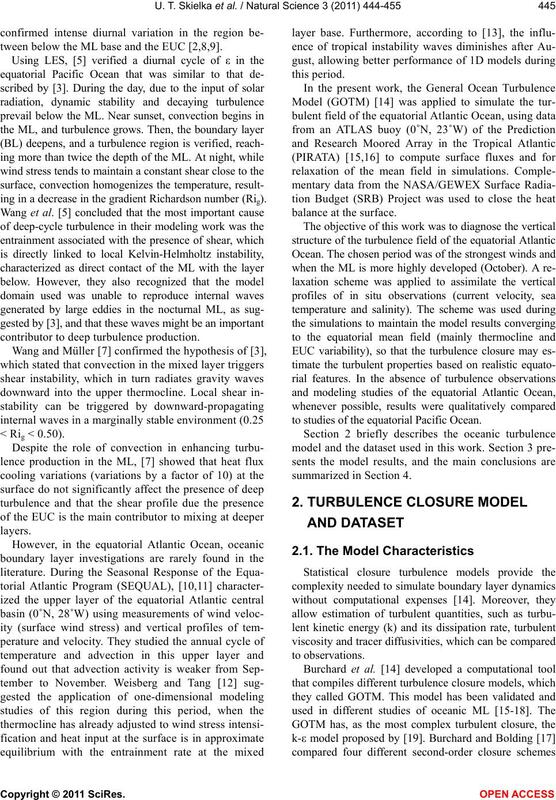 on the shear-flow turbulence in the equatorial ocean. of Physical Oceanography, 29, 5-28.
waves. 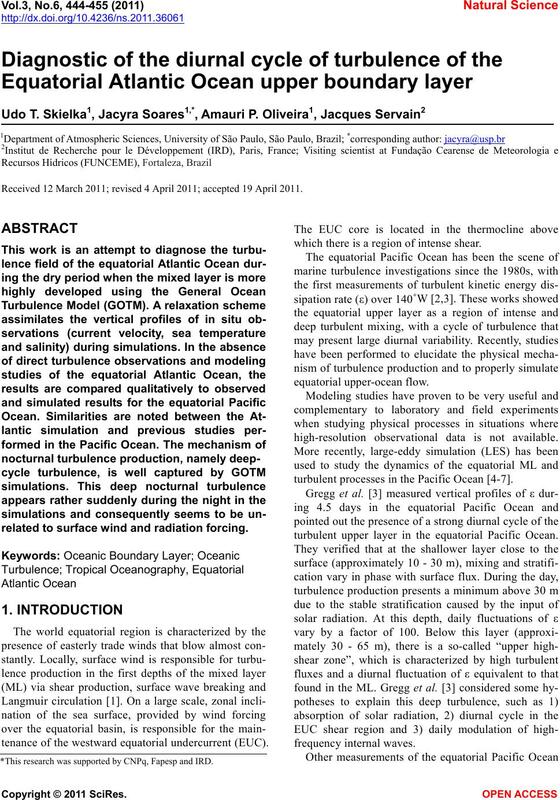 Journal of Physical Oceanography, 32, 1041-1057. Lien, R.-C., Caldwell, D.R., Gregg, M.C. and Moum, J.N. Pacific at the beginning of the 1991-1993 El Niño. 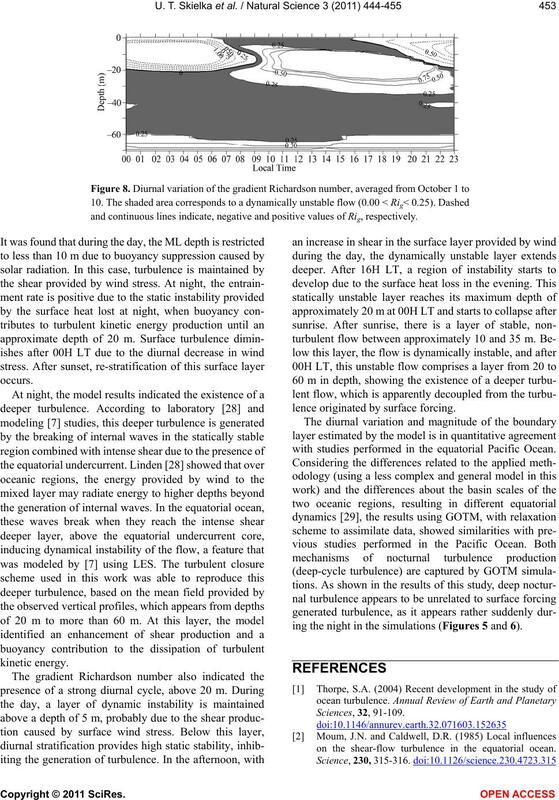 Journal of Geophysical Research, 100, 6881-6898. Bolding, K., Burchard, H., Pohlmann, T. and Stips, A.
 Jefrey, C.D., Robinson, I.S., Woolf, D.K. and Donlon C.J. exchange. Ocean Modelling, 23, 33-48.
ocean. Deep-Sea Research, 55, 847-865. Canuto, V.M., Howard, A., Cheng Y. and Dubovikov M.S. computation of fundamental properties of seawater. 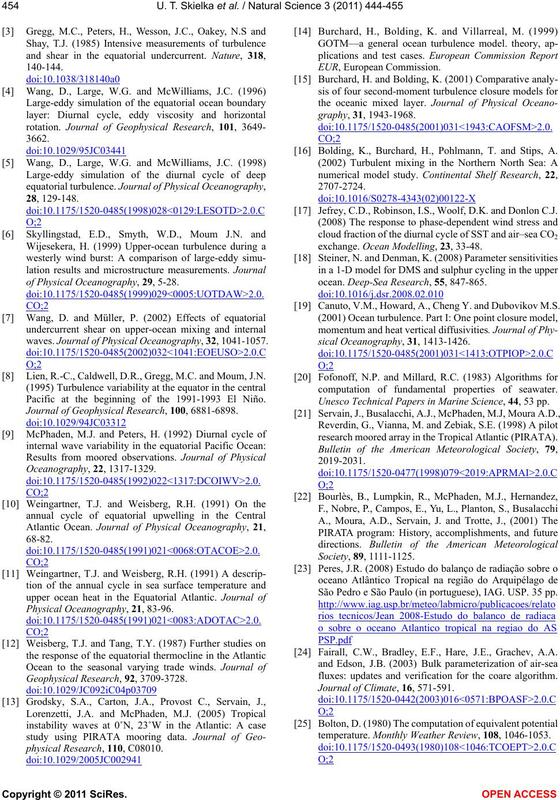 Unesco Technical Papers in Marine Science, 44, 53 pp. research moored array in the Tropical Atlantic (PIRATA). São Pedro e São Paulo (in portuguese), IAG. USP. 35 pp. 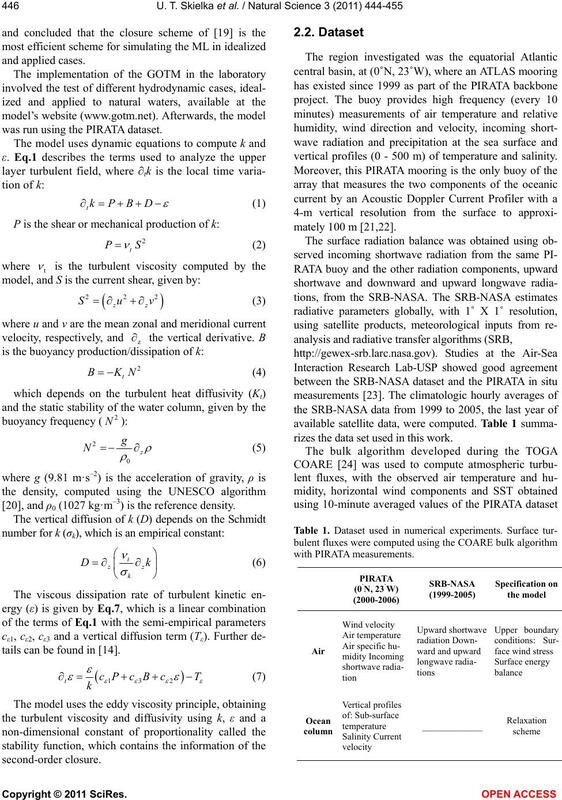 Fairall, C.W., Bradley, E.F., Hare, J.E., Grachev, A.A.
fluxes: updates and verification for the coare algorithm. Journal of Climate, 16, 571-591.
temperature. Monthly Weather Review, 108, 1046-1053. 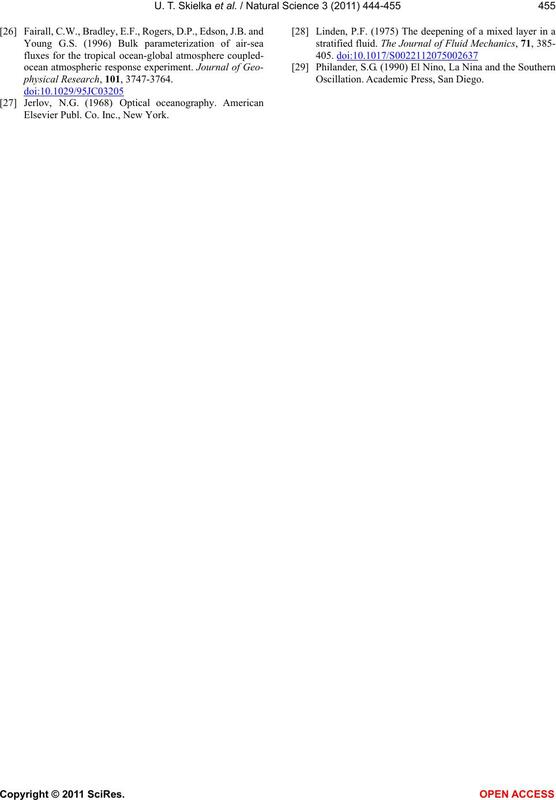 Elsevier Publ. Co. Inc., New York. Oscillation. Academic Press, San Diego.